It has been a while since I have written anything under this heading. We just returned from a trip to New York. 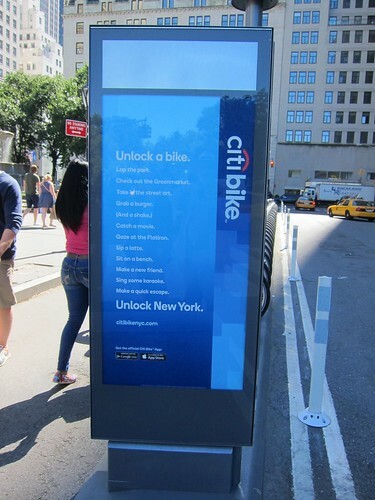 Given all the press attention it has received, we could hardly ignore the new bike sharing system known there as citibikes after its sponsor. (In London people refer to them as “Boris Bikes” rather than “Barclays Bikes”). I visit New York quite a bit as my son lives there, and have got to know my way about Manhattan. I have also now visited Queens, Brooklyn and Staten Island too: the Bronx I am saving for later. As with Paris, my first instinct was to try and get everywhere by subway, but I soon learned its limitations. “The only way to get across town is to be born there.” Like most visitors, there’s a lot of walking – and “flaneuring” – too. A lot of people got very upset when these stations started appearing. I think they are neat and tidy, but what they seemed to do was take away that precious commodity – on street parking spaces. In fact, very few people can actually use on street spaces, since there are so few of them and much of the curb space is needed for deliveries. All over Manhattan much space is taken by large black limousines and SUVs waiting for passengers (livery cars are an important part of the transportation system but are not taxis). The price of off street parking is of course ridiculous – and much traffic is simply circling looking for an on street spot. I am writing about my experience and this is not intended as a detailed critique of the system. There is plenty on line about how to use the system, but as usual the PR folks have made the process look a lot easier than it is in practice. It is not just a question of sliding in your credit card. There are a number of screens that you have to go through and on line forms to fill in. One good thing is that the screen accepts CA as the country code in default of a zip code. That is not possible at other terminals, like ticket vending machines at subway stations – or self serve gas pumps. My partner found that after going through the entire process it simply failed – something we also experienced in Paris. I managed to use two different credit cards for two separate bikes: I think you can register more than one bike at a time, but this seemed easier if we wanted to use them at a docking station later. Getting the bike is simple. Having completed the registration process, you get a five digit code to punch into a dock – the buttons are on the left hand side – and a green light comes on to tell you to take the bike. This is time limited. Returning is equally simple. 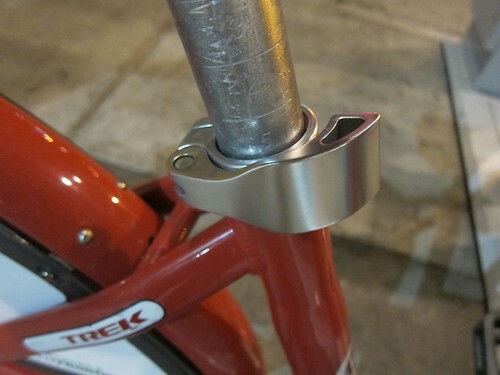 Push the front wheel into the dock until the green light comes on. 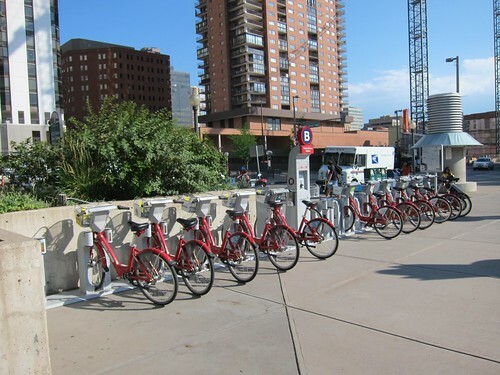 As you might expect, there are times when the stations are full of bikes – which makes it easy to rent hard to return. Equally we would have used the bikes more often but either the station was empty or not co-operating. We saw one man with a citibike key fob that he could put into the dock, but it refused to give up its bke. And that would have left only one for the two of us. I did not feel like using my card in a system that was behaving like that, but maybe the bike had been reported damaged. Yes, you can do that (“notify us by pushing the white wrench button on the top of the dock”) I do not recall seeing that very useful tool in Paris. I strongly recommend the use of a smart phone or tablet to find bikes and stations. Like car2go it is not exactly essential but makes life a lot easier. I would also, like car2go too, not rely on the system exclusively. You will still need a Metrocard, and do not neglect the ferry system either. The Staten Island ferry is free, and the East River ferry only $4, which is still great value. Contrary to the instructions, these bikes were simply left while the people who had rented them went and looked at the carousel in Central Park. If they had been stolen while they were in there, it would have cost them plenty. 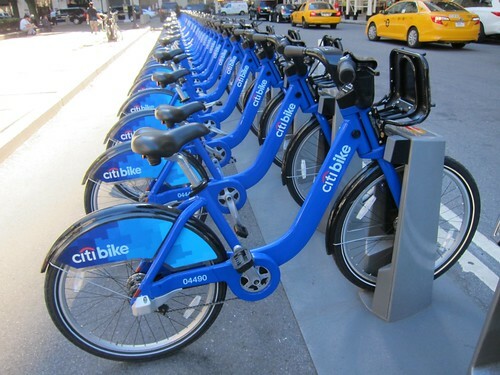 Even citibike say that for protracted periods, conventional bike rentals are a better deal. Since it costs $9.95 for a 24 hour pass, it is actually cheaper to rent if you do not intend to make a large number of trips. The first thirty minutes do not incur an extra fee so you can keep swapping bikes – but then you have t be able to find them when you need them. We would have got much more use out of our membership if bikes had actually been available when and where we needed them. 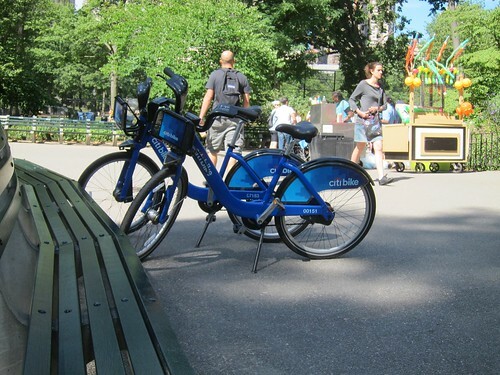 While we were looking at a bike station near Central Park, we were approached by a sidewalk salesman for one of the bike rental companies, offering a very attractive deal. And, this being New York, you could always try haggling. I’ve used these bike share in a few over the years cities: Barcelona, Melbourne, Paris, and Montreal. There is a time penalty in walking to a station, getting a bike, finding a station, then walking to the destination. For a typical trip, wasted time might add up to 5 or 10 minutes. To beat walking, the trip must be at least a few minutes more than a 10- to 15-minute walk or 1000 m to 1500 m. If a helmet is required, the time penalty might be another few minutes, but it’s unlikely that many will bother. Barcelona’s system requires residency, so a friend had to let me use it, and the interface is only in Spanish and Catalan. I used it like a tourist and I didn’t get a good feel for it. I think it was in its infancy then, anyway. Melbourne’s system is entirely useless, even without the helmet law. Nearly all of the stations are loosely within walking distance. The time penalty to get a helmet, even if helmets were sold in 7-11s as advertized (the map says they do but they don’t), makes walking faster than biking. The generally poor quality of cycling infrastructure also makes it unpleasant. I found the systems in Paris and Montreal easy to use and well-organized. 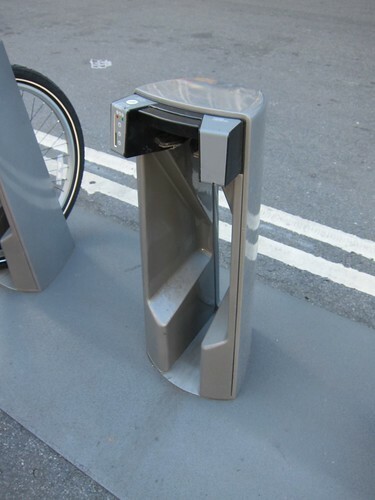 Bike stations are well-spaced and easy to find. The systems cover enough ground that it can save considerable time over walking. My understanding is that bikes in need of maintenance have their seat turned backwards. I wish I had known about that seat turned backwards thing. It explains a lot!